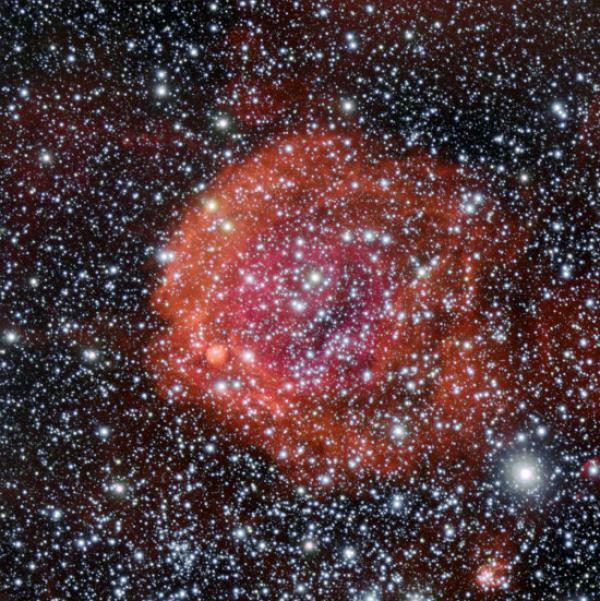 The vivid red cloud in this new image from ESO’s Very Large Telescope is a region of glowing hydrogen surrounding the star cluster NGC 371. This stellar nursery lies in our neighbouring galaxy, the Small Magellanic Cloud. The object dominating this image may resemble a pool of spilled blood, but rather than being associated with death, such regions of ionised hydrogen — known as HII regions — are sites of creation with high rates of recent star birth. NGC 371 is an example of this; it is an open cluster surrounded by a nebula. The stars in open clusters all originate from the same diffuse HII region, and over time the majority of the hydrogen is used up by star formation, leaving behind a shell of hydrogen such as the one in this image, along with a cluster of hot young stars. The host galaxy to NGC 371, the Small Magellanic Cloud, is a dwarf galaxy a mere 200 000 light-years away, which makes it one of the closest galaxies to the Milky Way. In addition, the Small Magellanic Cloud contains stars at all stages of their evolution; from the highly luminous young stars found in NGC 371 to supernova remnants of dead stars. These energetic youngsters emit copious amounts of ultraviolet radiation causing surrounding gas, such as leftover hydrogen from their parent nebula, to light up with a colourful glow that extends for hundreds of light-years in every direction. The phenomenon is depicted beautifully in this image, taken using the FORS1 instrument on ESO’s Very Large Telescope (VLT).